Area: 25,713 square km. (slightly larger than Vermont). Cities (2001 est. ): Capital: Skopje (600,000); Tetovo, Kumanovo, Gostivar, and Bitola (more than 100,000). Geography: Situated in the southern region of the Balkan Peninsula, Macedonia is landlocked and mountainous. Climate: Three climatic types overlap — Mediterranean; moderately continental; and mountainous, producing hot, dry summers and cold, snowy winters. Population growth rate (2010 est. ): 0.25%. Religions (2002): Eastern Orthodox 64.78%, Muslim 33.33%, Catholic 0.35%, and others 1.54%. Languages (2002): Macedonian 66.49%, Albanian 25.11%, Turkish 3.55%, Romani 2%, Serbian 1.22%, Bosniac 0.42%, Vlach 0.34%, and other 0.87%. Education: Years compulsory: 13 (9 primary and 4 secondary). Literacy — 96.1% (98.2% for males, 94.1% for females). Health: Infant mortality rate (2011 est.) — 8.54 deaths/per 1,000 live births. Life expectancy (2011 est.) — males 72.61 years; females 77.87 years. Labor force (second quarter 2011): Total — 936,256; employed — 642,809. By occupation — services 45.3%; industry and commerce 35.6%; agriculture 19.1%. Independence: September 8, 1991 (from Yugoslavia). Branches: Executive: prime minister (head of government), council of ministers (cabinet), president (head of state). Legislative — unicameral parliament or Sobranie (123 members elected by popular vote to 4-year terms from party lists based on the percentage parties gain of the overall vote in each of six election units with 20 seats per unit, and three election units for the diaspora with one seat per unit). Judicial — Supreme Court, Judicial Council, Constitutional Court, Higher Administrative Court, Public Prosecutor's Office, Prosecutorial Council, and Public Attorneys. Legal system is based on civil law; judicial review of legislative acts. Subdivisions: 84 opstini (municipalities) plus the city of Skopje. Main political parties: VMRO-DPMNE - Democratic Party for Macedonian National Unity (Nikola Gruevski), SDSM - Social Democratic Union of Macedonia (Branko Crvenkovski), DUI - Democratic Union for Integration (Ali Ahmeti), DPA - Democratic Party of the Albanians (Menduh Thaci), New Social-Democratic Party (Tito Petkovski), Party for European Future (Fijat Canoski), Socialist Party of Macedonia (Ljubisav Ivanov Dzingo), National Democratic Revival (Rufi Osmani), Movement for National Unity of Turks in Macedonia (Erdogan Sarac), Democratic Union (Pavle Trajanov), Liberal Party (Ivon Velickovski), Serbian Progressive Party in Macedonia (Dragisa Miletic), Party for Democratic Action in Macedonia (Avdija Pepic), Party for the Total Emancipation of Roma (Samka Ibraimoski), Democratic Renewal of Macedonia (Liljana Popovska), Democratic Party of Turks in Macedonia (Kenan Hasipi), Democratic Party of Serbs in Macedonia (Ivan Stoiljkovic), VMRO-Macedonian (Borislav Stojmenov), Democratic League of Bosniaks in Macedonia (Rafet Muminovic), Union of Roma of Macedonia (Amdi Bajram). GDP (2011 est. ): $9.8 billion. Per capita GDP (2010 est. ): $9,400. Real GDP growth (2011 est. ): 3.5%. Annualized inflation rate (2011, Consumer Price Index): 3.4%. Unemployment rate (second quarter 2011): 31.3%. Trade: Significant exports: metal compounds, catalysts, ferro-nickel, iron and steel, textiles, petroleum, wine, tobacco, and lamb. Official exchange rate (2011): 44.544 Macedonian denars (MKD) = U.S. $1. Macedonia is located in the heart of south central Europe. It shares a border with Greece to the south, Bulgaria to the east, Serbia and Kosovo to the north, and Albania to the west. The country is 80% mountainous, rising to its highest point at Mt. Korab (peak 2,764 meters). Since the end of the Second World War, Macedonia's population has grown steadily, with the greatest increases occurring in the ethnic Albanian community. From 1953 through the time of the latest official census in 2002, the percentage of ethnic Albanians living in Macedonia rose threefold. The western part of the country, where most ethnic Albanians live, is the most heavily populated, with approximately 40% of the total population. As in many countries, people have moved into the cities in search of employment. Macedonia has also experienced sustained high rates of permanent or seasonal emigration. After more than 4 centuries of rule, Ottoman power in the region began to wane, and by the middle of the 19th century, Greece, Bulgaria, and Serbia were competing for influence in the territory. During this time, a nationalist movement emerged and grew in Macedonia. The latter half of the 19th century, continuing into the early part of the 20th century, was marked by sporadic nationalist uprisings, culminating in the Ilinden Uprising of August 2, 1903. Macedonian revolutionaries liberated the town of Krushevo and established the short-lived Republic of Krushevo, which was put down by Ottoman forces after 10 days. Following Ottoman Turkey's defeat by the allied Balkan countries — Bulgaria, Serbia, Montenegro, and Greece — during the First Balkan War in autumn 1912, the same allies fought the Second Balkan War over the division of Macedonia. The August 1913 Treaty of Bucharest ended this conflict by dividing the territory between Bulgaria, Greece, and Serbia. The 1919 Treaty of Versailles sanctioned partitioning the geographic region of Macedonia among the Kingdom of Serbs, Croats, and Slovenes; Bulgaria; and Greece. In the wake of the First World War, Vardar Macedonia (the present-day area of the Republic of Macedonia) was incorporated into the newly formed Kingdom of Serbs, Croats, and Slovenes. Throughout much of the Second World War, Bulgaria and Italy occupied Macedonia. Many citizens joined partisan movements during this time and succeeded in liberating the region in late 1944. Following the war, Macedonia became one of the constituent republics of the new Socialist Federal Republic of Yugoslavia under Marshall Tito. During this period, Macedonian culture and language flourished. As communism fell throughout Eastern Europe in the late 20th century, Macedonia followed its other federation partners and declared its independence from Yugoslavia in late 1991. After independence, Prime Minister Nikola Kljusev remained Prime Minister, heading a government of experts, and Kiro Gligorov remained President. 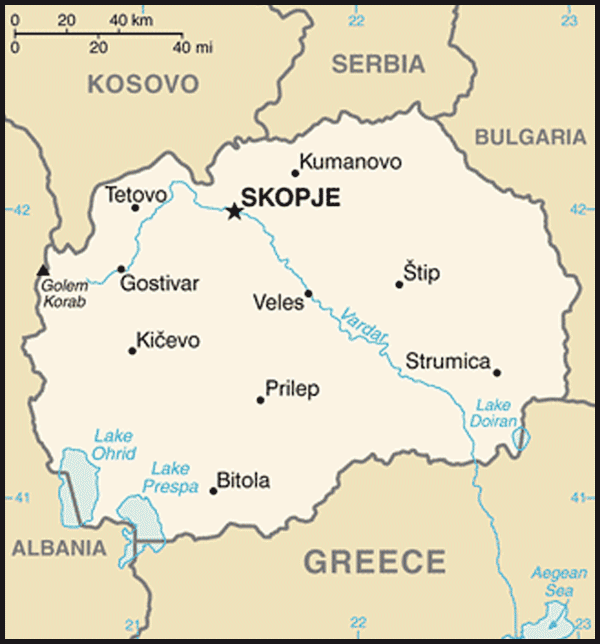 Macedonia was the only republic of the former Yugoslavia whose secession in 1991 was not clouded by ethnic or other armed conflict, although the ethnic Albanian population declined to participate in the referendum on independence. The new Macedonian constitution took effect November 20, 1991 and called for a system of government based on a parliamentary democracy. The first democratically elected coalition government was led by Prime Minister Branko Crvenkovski of the Social Democratic Union of Macedonia (SDSM). President Gligorov was the first president of a former Yugoslav republic to relinquish office. In accordance with the terms of the Macedonian constitution, his presidency ended in November 1999 after 8 years in office, which included surviving a car bombing assassination attempt on October 3 in 1995. He was succeeded by former Deputy Foreign Minister Boris Trajkovski (VMRO-DPMNE), who defeated Tito Petkovski (SDSM) in a second-round run-off election for the presidency on November 14, 1999. Trajkovski's election was confirmed by a December 5, 1999 partial re-vote in 230 polling stations, which the Macedonian Supreme Court mandated due to election irregularities. In November 1998 parliamentary elections, SDSM lost its majority. A new coalition government emerged under the leadership of Prime Minister Ljubco Georgievski of the Internal Macedonian Revolutionary Organization-Democratic Party for Macedonian National Unity (VMRO-DPMNE). The initial coalition included the ethnic Albanian Democratic Party of Albanians (DPA). During the Yugoslav period, most of Macedonia's Slavic population identified themselves as Macedonians, while several minority groups, in particular ethnic Albanians, retained their own distinct political culture and language. Although interethnic tensions simmered under Yugoslav authority and during the first decade of its independence, the country avoided ethnically motivated conflict until several years after independence. Ethnic minority grievances, which had erupted on occasion (1995 and 1997), rapidly began to gain political currency in late 2000, leading many in the ethnic Albanian community in Macedonia to question their minority protection under, and participation in, the government. Tensions erupted into open hostilities in Macedonia in February 2001, when a group of ethnic Albanians near the Kosovo border carried out armed provocations that soon escalated into an insurgency. Purporting to fight for greater civil rights for ethnic Albanians in Macedonia, the group seized territory and launched attacks against government forces. Many observers ascribed other motives to the so-called National Liberation Army (NLA), including support for criminality and the assertion of political control over affected areas. The insurgency spread through northern and western Macedonia during the first half of 2001. Under international mediation, a cease-fire was brokered in July 2001, and the government coalition was expanded in July 2001 to form a grand coalition which included the major opposition parties. The expanded coalition of ruling ethnic Macedonian and ethnic Albanian political leaders, with facilitation by U.S. and European Union (EU) diplomats, negotiated and then signed the Ohrid Framework Agreement on August 13, 2001, which brought an end to the fighting. The agreement called for implementation of constitutional and legislative changes, which laid the foundation for improved civil rights for minority groups. The Macedonian parliament adopted the constitutional changes outlined in the accord in November 2001. The grand coalition disbanded following the signing of the Ohrid Framework Agreement and the passage of new constitutional amendments. A coalition led by Prime Minister Georgievski, including DPA and several smaller parties, completed its parliamentary term. In September 2002 elections, an SDSM-led pre-election coalition won half of the 120 seats in parliament. Branko Crvenkovski was elected Prime Minister in coalition with the ethnic Albanian Democratic Union for Integration (DUI) party, the Liberal-Democratic Party (LDP), and a number of smaller ethnic parties. On February 26, 2004 President Trajkovski died in a plane crash in Bosnia and Herzegovina. Presidential elections were held April 14 and 28, 2004. Then-Prime Minister Branko Crvenkovski won the second round and was inaugurated President on May 12, 2004. The parliament confirmed Hari Kostov, former Interior Minister, as Prime Minister June 2, 2004, but Kostov resigned on November 15 of the same year. On December 17, 2004, former Defense Minister Vlado Buckovski was confirmed by parliament as Prime Minister, maintaining the coalition with the ethnic Albanian Democratic Union for Integration (DUI) and the Liberal-Democratic (LDP) parties. With international assistance, the SDSM-DUI-LDP governing coalition completed the legislative implementation of the Ohrid Framework Agreement, which is a precondition for Macedonia's integration into Euro-Atlantic institutions. A November 7, 2004 referendum opposing the law on new municipal organization failed, freeing the way for the government to complete Framework Agreement implementation. Local elections were held in March-April 2005 under a new territorial reorganization plan that consolidated the overall number of Macedonia's municipalities and created a number of ethnically-mixed municipalities in which ethnic Albanian populations were dominant. The process of decentralization began in the new municipalities in July 2005. The July 2006 parliamentary elections resulted in a VMRO-DPMNE-led government under Prime Minister Nikola Gruevski, in coalition with DPA, NSDP, and several smaller parties. The new government, which was confirmed in office by a parliamentary vote on August 26, 2006, stated its commitment to completing Framework Agreement implementation and reaffirmed its commitment to pursuing NATO and EU membership. At NATO's Bucharest Summit in April 2008, all 26 NATO Allies agreed Macedonia had met the criteria for membership. Consensus on extending a NATO membership invitation could not be reached, however, due to the unresolved dispute with Greece over Macedonia's name. Following the Bucharest Summit, the opposition DUI party, in collaboration with the governing VMRO-DPMNE and DPA parties, called for the dissolution of parliament and for early parliamentary elections, which were held in June 2008. On July 26, Prime Minister Gruevski was reconfirmed in office with a new coalition along with the DUI party and one smaller party. In 2009, Macedonia held presidential and local elections in March (first round) and April (second round). In the presidential race, VMRO-DPMNE candidate Gjorge Ivanov won with 64% of the vote. Early parliamentary elections were held in June 2011. The unicameral assembly (Sobranie) consists of 123 seats. Members are elected by popular vote from party lists, based on the percentage parties gain of the overall vote in each of six election districts and three diaspora districts. Election districts have 20 seats each and the diaspora districts have one seat each. Members of parliament have a 4-year mandate. The President represents Macedonia at home and abroad. He is the commander in chief of the armed forces of Macedonia and heads its Security Council. He also appoints the Chief of the Defense Staff (CHOD), the head of the intelligence agency, and the Governor of the National Bank of the Republic of Macedonia (NBRM). The President is elected by general, direct ballot and has a term of 5 years, with the right to one re-election. The court system consists of a Supreme Court, Constitutional Court, local and appeals courts, and administrative and higher administrative courts. Judges appointed by the Judicial Council are appointed without a time limit. The Judicial Council also evaluates, promotes, disciplines, and removes judges. The Supreme Court is the highest court in the country and is responsible for the equal administration of laws by all courts. The Constitutional Court is responsible for the protection of constitutional and legal rights and for resolving conflicts of power among the three branches of government. Its nine judges are appointed by parliament with a mandate of 9 years, without the possibility of re-election. The Public Prosecutor is appointed by parliament with a 6-year mandate. The country maintains an embassy (http://www.macedonianembassy.org/) in the United States at 2129 Wyoming Ave, NW, Washington, DC 20008 (tel: (202) 667-0501; fax: (202) 667-2131). It maintains a Consulate General in Detroit: 2000 Town Center, Suite 1130, Southfield, MI 48075 (tel: (248) 354-5537; fax: (248) 354-5538); and a Consulate General in Chicago: 121 West Wackor Drive, Suite 2036, Chicago, IL 60601 (tel: (312) 419-8020; fax: (312) 419-8040). Macedonia is a small economy with a gross domestic product (GDP) of about $9.8 billion (2011 est. ), representing about 0.01% of the total world output. It is an open economy, highly integrated into international trade, with a total trade-to-GDP ratio of 95.9% at the end of 2010. The services sector is becoming increasingly important, accounting for more than 45% of GDP creation. The industrial sector, which was dominant in the early transition years, is now secondary, although it remains the leading exporting sector. Agriculture is gradually losing significance in terms of GDP creation. Although macroeconomic fundamentals are stable, economic problems and risks remain, mainly associated with the country's endeavors to complete structural reforms necessary to finish the transition to a market-oriented economy. Modernization of the largely obsolete infrastructure is happening slowly, and foreign investment has not kept pace with neighboring economies. Labor force education and skills are competitive in some technical areas and industries but significantly lacking in others. Without adequate job opportunities, many with the best skills seek employment abroad. A relatively low standard of living, a high unemployment rate, and modest economic growth rate are the central economic problems. After the 2001 inter-ethnic conflict, growth started to pick up in 2003 (2.8%) and continued in 2004 (4.6%), 2005 (4.4%), 2006 (5.0%), 2007 (6.1%), and 2008 (5.0%). Macedonia felt the effects of the world economic crisis mostly in its real estate sector in 2009, with real GDP dropping by 0.9%, a modest recession compared to EU economies. At the same time, the financial sector remained sound largely due to conservative banking and financial regulation, limited exposure to global financial markets, and dependence on domestic deposits rather than foreign credit lines. The economy slowly started to recover in 2010 as real GDP grew by 1.8%, and recovery continued in 2011. Inflation, measured by the Consumer Price Index (CPI), is generally kept under control despite hikes in oil and food prices on world markets. Living standards still lag behind those enjoyed before independence. The United States supports Macedonia's transition to a democratic, secure, market-oriented society through targeted foreign assistance. After the breakup of Yugoslavia in 1991, Macedonia, which was the poorest republic in Yugoslavia, faced formidable economic challenges posed by both the transition to a market economy and a difficult regional situation. The breakup deprived Macedonia of key protected markets and large transfer payments from the central Yugoslav government. The war in Bosnia, international sanctions on Serbia, and the 1999 crisis in neighboring Kosovo delivered successive shocks to Macedonia's trade-dependent economy. The government's painful but necessary structural reforms and macroeconomic stabilization program generated additional economic dislocation. Macedonia's economy was hurt especially by a trade embargo imposed by Greece in February 1994 in a dispute over the country's name, flag, and constitution, and by international trade sanctions against Serbia that were not suspended until a month after conclusion of the Dayton Accords. The impact of the 2001 ethnic Albanian insurgency in Macedonia, decreased international demand for Macedonian products, canceled contracts in the textile and iron and steel industry, and poor restructuring of the private sector affected Macedonia's growth and foreign trade prospects. Macedonia's political and security situation is stable. This stability has allowed the government to refocus energies on domestic reforms, boosting economic growth, and attracting increased levels of foreign investment. In 2004, the government passed a progressive Trade Companies Law aimed at easing impediments to foreign investment, providing tax and investment incentives, and guaranteeing shareholder rights. In addition, in 2007 the government conducted a "regulatory guillotine" project that significantly trimmed regulation, making it easier to conduct business in the country. This was followed by a Regulatory Impact Assessment (RIA) exercise that allows business community input in formulating business legislation. The government's fiscal policy, aligned with International Monetary Fund (IMF) and World Bank policies, helped maintain a stable macroeconomic environment, which sent promising signals to investors. However, economic growth remains sub-par in the transition period so far, due in part to poor government results in combating corruption, a weak judiciary, poor contract enforcement and rule of law implementation, and high domestic finance costs. The government that took office in August 2006 put the fight against corruption and attracting foreign investors at the very top of its priority list. In 2007, it launched an expensive marketing campaign promoting the country as a good investment destination and implemented a one-stop process for business registration that considerably shortened the time required to register a new business. It provided business incentives by cutting rates on profit tax and personal income tax, eliminating taxes on reinvested profits, and gradually reducing social contribution rates. In 2010, the government launched a rather expensive program called "Skopje 2014" to beautify the capital with new buildings, bridges, monuments, and other projects. Real GDP in the first half of 2011 increased by 5.2%. This robust growth was mainly driven by 23.6% growth in the construction sector; 13.2% in mining, quarrying, and manufacturing; 12.4% in wholesale and retail trade; and 4.2% in transport and communication services. Industrial output in the first 8 months of 2011 was 7.5% higher than in the same period of 2010. Low public and external debt and a comfortable level of foreign exchange reserves allowed for further relaxation of monetary policy, with the reference interest rate of the Central Bank decreasing to 4%. Due to rising prices for energy, fuel, and food on international markets, inflation increased in the first half of 2011, but later decreased to an annualized rate of 3.4% at the end of September. The official unemployment rate dropped to 31.3% in the second quarter of 2011, but remained one of the highest in Europe. Many people work in the gray economy, and many experts estimate Macedonia's actual unemployment as being somewhere between 20%-25%. The government budget has generally kept within projections. The budget deficit at the end of August 2011 reached about 2% of GDP, and fiscal authorities seemed committed to keeping it under the projected target of 2.5% of GDP by the end of the year. In addition to 220 million euros (approx. $298 million) drawn from an IMF Precautionary Credit Line (PCL) in March, financing mostly came from domestic borrowing. However, by the end of the year a financing gap remained of about 50 million to 60 million euros (approx. $67 million to $81 million), which the government plans to cover by borrowing from international capital markets, supported by a policy-based guarantee by the World Bank. The central government's public debt remained low at 26% of GDP, but represents a gradual increase from previous years. Despite lowering the Central Bank bills rate, the Central Bank has not changed liquidity indicators for banks or the reserve requirement since 2009, curbing credit growth to 7.5% in the first three quarters of 2011. Macedonia's external trade struggled in 2010 due to the slow recovery from the economic crisis of its main trading partners, particularly EU members. Starting from a very low base, export growth in the first 8 months of 2011 reached 41.7%, topping import growth of 36.8%. The trade deficit has widened to 18.3% of GDP, approaching the end-year target of 21.9% of GDP. At the same time, the current account balance deficit significantly improved and the end-year projection was revised upward to 5.5% of GDP. This was due primarily to a 4.4% higher inflow of current transfers, mostly during the summer, and came despite a poor level of foreign direct investment (FDI) of only $237.2 million by end-July 2011. Foreign currency reserves remained at about $2.6 billion, a level that comfortably covers 4 months of imports and about 110% of the country's short-term debt. In October 2010, the World Bank Board of Directors approved a new Country Partnership Strategy (CPS) with Macedonia for the period 2011-2014. This CPS will provide the country assistance of about $100 million in funding for the first 2 years to improve competitiveness, strengthen employability and social protection, and increase the use of sustainable energy. This assistance also includes a commitment of $30 million in direct budget support in the form of a policy-based guarantee by the World Bank to the government to facilitate its access to financing from international capital markets, a process that had been started as of November 2011. Macedonia became the first country eligible for the IMF's Precautionary Credit Line in January 2011. This program gives Macedonia a line of credit worth 475 million euros (about $675 million) over 2 years, intended to be accessed only in case of need brought about by external shocks. The credit line was approved after extensive consultations with the IMF in October and December 2010. The IMF expects that there will be no additional withdrawals from the PCL. Macedonia remains committed to pursuing membership in the European Union and NATO. It became a full World Trade Organization (WTO) member in April 2003. Following a 1997 cooperation agreement with the European Union (EU), Macedonia signed a Stabilization and Association Agreement with the EU in April 2001, giving Macedonia duty-free access to European markets. In December 2005, it moved a step forward, obtaining candidate country status for EU accession. Macedonia has had a foreign trade deficit since 1994, which reached a record high of $2.873 billion in 2008, or 30.2% of GDP. Total trade in 2010 (imports plus exports of goods and services) was $8.752 billion, and the trade deficit amounted to $2.149 billion, or 23.4% of GDP. In the first 8 months of 2011, total trade was $7.470 billion and the trade deficit was $1.778 billion. A significant 56.5% of Macedonia's total trade was with EU countries. 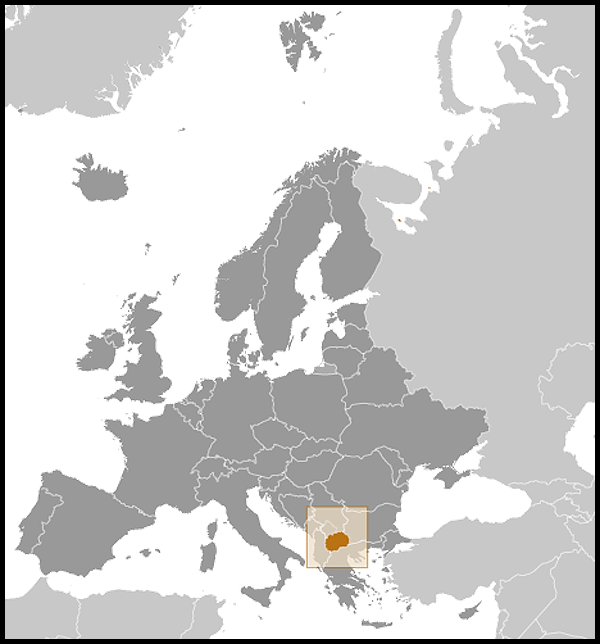 Macedonia's major trading partners are Germany, Greece, Serbia, Bulgaria, Russia, and Italy. In 2010, total trade between Macedonia and the United States was $116.6 million, and in the first 8 months of 2011 it was $65 million. U.S. meat, mainly poultry, and electrical machinery and equipment have been particularly attractive to Macedonian importers. Principal Macedonian exports to the United States are tobacco, apparel, iron, and steel. Macedonia has bilateral free trade agreements with Ukraine, Turkey, and the European Free Trade Association (EFTA — Switzerland, Norway, Iceland, and Liechtenstein). Bilateral agreements with Albania, Bosnia and Herzegovina, Croatia, Serbia, Montenegro, UN Mission in Kosovo (UNMIK), and Moldova were replaced by membership in the Central European Free Trade Agreement (CEFTA). Macedonia also has concluded an "Agreement for Promotion and Protection of Foreign Direct Investments" with Albania, Austria, Bosnia and Herzegovina, Bulgaria, Belarus, Belgium, Luxembourg, Germany, Egypt, Iran, Italy, India, Spain, Serbia, Montenegro, People's Republic of China, Republic of Korea, Malaysia, Poland, Romania, Russia, Slovenia, Turkey, Ukraine, Hungary, Finland, France, the Netherlands, Croatia, Czech Republic, Switzerland, and Sweden. Macedonia established its armed forces following independence and the complete withdrawal of the Yugoslav National Army (JNA) in March 1992. The Macedonian Armed Forces consist of an army, navy, air and air defense force, and a police force (under the Ministry of Interior). Under its North Atlantic Treaty Organization (NATO) Membership Action Plan, Macedonia has made strong strides on major reforms and reconstruction of its armed forces toward the goal of building and sustaining a modern, professional defense force of about 12,000 troops. Macedonia continues to play an indispensable role as the Kosovo Force's (KFOR) rear area, hosting the logistical supply line for KFOR troops in Kosovo. As part of these efforts, Macedonia hosts NATO troops, including U.S. troops, in support of NATO operations in Kosovo and to assist Macedonia's efforts to reform its military to meet NATO standards. Close U.S.-Macedonian bilateral defense cooperation continues. Macedonia has contributed troops to international coalition operations in Iraq, and continues to have troops in Afghanistan and in the EU peace support operation in Bosnia and Herzegovina, with 4% of its military. The stability of the young state was gravely tested during the 1999 Kosovo crisis, when Macedonia temporarily hosted about 360,000 refugees from the violence and ethnic cleansing in Kosovo. The refugee influx put significant stress on Macedonia's weak social infrastructure. With the help of NATO and the international community, Macedonia ultimately was able to accommodate the influx. Following the resolution of the conflict, the overwhelming majority of refugees returned to Kosovo. A small number of Roma refugees from Kosovo remains in Macedonia, most of them housed in the predominantly Roma municipality of Suto Orizari in the Skopje suburbs, and supported by the UN High Commissioner for Refugees (UNHCR). Macedonia enjoys good relations with its neighbors. It has strong trade and tourism ties with Greece, and has developed similarly robust political and trade ties with Albania and Bulgaria. Relations between Belgrade and Skopje are good overall, although a dispute between the Macedonian Orthodox Church and the Serb Orthodox Church has strained ties over the past several years. Relations with Kosovo are good, with Macedonia having signed an Interim Free Trade Agreement with UNMIK in 2005 and with regular bilateral political contacts occurring between Pristina and Skopje since 2005. Macedonia recognized Kosovo's independence in October 2008. Macedonia and Kosovo completed demarcation of their shared border and established formal diplomatic relations in October 2009. Macedonia has made important strides toward Euro-Atlantic integration. Macedonia is an active participant in NATO's Partnership for Peace and Membership Action Plan, the OSCE, and United Nations, and was accepted as a member of the World Trade Organization (WTO) in October 2002. In May 2003, Macedonia, Albania, Croatia, and the U.S. created the Adriatic Charter, modeled on the Baltic Charter, as a mechanism for promoting regional cooperation to advance each country's NATO candidacy. Since then, the Adriatic Charter countries have cooperated closely in regional military exercises, and have deployed a joint medical team to support international coalition operations in Afghanistan. The Adriatic Charter expanded to include Bosnia-Herzegovina and Montenegro as members in December 2008. At the NATO Bucharest Summit in April 2008, Albania and Croatia received invitations to join the Alliance. NATO Allies noted that Macedonia met NATO membership criteria, but could not reach consensus on issuing an invitation for membership, in the absence of a solution to Macedonia's dispute with NATO member Greece over Macedonia's name. The United States believes Macedonia has met the performance-based standards for membership. At the April 2009 Strasbourg-Kehl Summit and the November 2010 Lisbon Summit, Allies re-confirmed the commitment to invite Macedonia to join NATO as soon as the name issue is resolved. In 1999, the EU agreed to pursue a Stabilization and Association Agreement (SAA) with Macedonia; negotiations with Macedonia were launched April 5, 2000. The SAA was signed in April 2001 and came into force in April 2004. Its trade and trade-related provisions have been in force since June 2001. In December 2005, the European Council granted candidate country status to Macedonia. In March 2008, the Council provided the Government of Macedonia a list of benchmarks to guide Macedonia's preparations to open formal accession negotiations. In October 2009, the European Commission recommended that Macedonia commence EU accession negotiations, but the European Council decided in December 2009 to defer discussion of a start date for negotiations, a decision which was repeated in 2010. The United States and Macedonia have enjoyed good bilateral relations since Macedonia gained its independence in 1991. The United States formally recognized Macedonia on February 8, 1994, and the two countries established full diplomatic relations on September 13, 1995. The U.S. Liaison Office was upgraded to an Embassy in February 1996, and the first U.S. Ambassador to Skopje arrived in July 1996. The development of political relations between the United States and Macedonia has ushered in a host of other contacts between the two states. The United States, together with its European allies, strongly condemned the initiators of the 2001 insurgency in Macedonia and closely supported the government and major parties' successful efforts to forge a peaceful, political solution to the crisis through the Ohrid Framework Agreement. In partnership with the EU and other international organizations active in Macedonia, the United States is facilitating the Macedonian Government's implementation of the Framework Agreement and fostering long-term peace and stability in the country. Macedonia continues to make an important contribution to regional stability by facilitating the logistical supply of NATO (including U.S.) peacekeepers in Kosovo. The United States strongly supports Macedonia's aspirations for full integration into Euro-Atlantic institutions. Today, Macedonia and the United States enjoy a cooperative relationship across a broad range of political, economic, cultural, military, and social issues. With targeted technical assistance for democracy and economic reforms, defense reforms, and projects to strengthen rule of law and improve education, the United States has supported Macedonia's progress in building a democratic, secure, and market-oriented multiethnic society. Bilateral assistance budgeted to Macedonia under the Support for East European Democracy (SEED) Act totaled over $500 million from 1990 to 2010. Macedonia received approximately $19 million in SEED Act assistance in 2009 and was scheduled to receive approximately $23 million in 2010. With SEED funds, the U.S. Agency for International Development (USAID) programs in Macedonia promote accelerated growth, support stronger democratic institutions, and help educate Macedonians for a modern economy. USAID's democracy assistance focuses on helping Macedonia to prepare for European Union (EU) and NATO accession by enhancing democratic political competition, strengthening civil society, supporting government decentralization, and promoting the rule of law. The assistance to local governments in Macedonia prioritizes fiscal decentralization, including the development of the necessary planning, management, and accounting skills to allow municipalities to access private credit markets and achieve EU standards. USAID also works to support the development of the judiciary into a stronger, more effective, and independent branch of government by introducing modern court administration practices and by improving court organization and performance. Technical assistance, training and operational support is provided to the Macedonian national legislature to increase the accountability of elected officials and strengthen their ability to represent the public. USAID's assistance to the civil society sector to date has focused on promoting reforms in the legal framework, advancing individual and corporate philanthropy and volunteerism, and improving the public image of the sector. USAID helped strengthen political party organizations at the local level to enhance their ability to serve as advocates of local issues and to foster increased reliance by political parties on issue-based politics and political communications. USAID also supported the State Commission for Prevention of Corruption in developing a comprehensive State Program for Prevention of Conflict of Interest and assisted in training over 150 judges and prosecutors in dealing with conflict of interest cases. A further priority of U.S. assistance is to facilitate Macedonia's transition to a market economy and increase employment and growth levels. USAID economic assistance is focused on two levels. At the macro-level, programs target improvements in the business-enabling environment by helping to bring legislative and regulatory frameworks in line with EU standards, build the capacity of the administration to implement them, and improve the transparency and efficiency of government services through technology. At the micro-level, assistance is given to firms and agribusinesses to increase their competitiveness and productivity, coupled with initiatives to attract foreign investment and stimulate local investment and support creation of new jobs and enterprises. Training programs that provide career-enhancing education to prepare youth and adults for growth sectors are also supported. In the energy area, USAID will support the Government of Macedonia to align the domestic energy system to EU norms, build institutional capacity to develop and implement energy policies, and help introduce energy efficiency interventions in households and the business sector. Complementing its assistance in Macedonia's political and economic transition, USAID programs have been improving education and human capacity in Macedonia through projects on the primary, secondary, and post-secondary education levels. Activities include improving teaching techniques; math, science, and technical curricula; and information and communication technology (ICT) use in the classroom; as well as applying quality assessment techniques. USAID also works on improving employability and soft skills of youth to prepare them for the needs of the modern labor market. A small program implemented by a local non-governmental organization (NGO) is training teachers to use assistive computer peripherals to better integrate children with special needs into regular classes. USAID is currently designing a project on ethnic integration in education. Other programs address crosscutting issues; assistance to the Roma minority; and performance improvement of key institutions, such as the Bureau for Development of Education, State Education Inspectorate, and the national Vocational Education and Training Center. On May 7, 2008, Secretary of State Condoleezza Rice and Foreign Minister Antonio Milososki signed a joint Declaration of Strategic Partnership and Cooperation affirming the determination of our governments to further expand and deepen the partnership between our two countries based upon common goals, interests, and values. The full text of the declaration is available at (http://2001-2009.state.gov/p/eur/rls/or/104441.htm). The U.S. Embassy (http://macedonia.usembassy.gov/) in Macedonia is located at Str. "Samoilova" Nr. 21. 1000 Skopje (tel:  (2) 310-2000; fax:  (2) 310-2299).